To offer a modified version of an old saying, familiarity breeds complacency. You can become so used to seeing your parking lot that you can be lulled into a false sense of security, satisfied that your pavement is holding up as it should. One day, something forces you to inspect your parking lot more closely, and to your surprise, you discover that your pavement has more problems than you had imagined. This can leave you wondering what happened to your parking lot. Unfortunately, there may be more than one factor involved, so examining the symptoms can help you determine what happened and how you need to proceed. 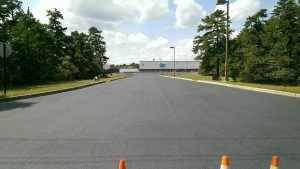 An Asphalt Sealcoating Parking Lot – What Happened? When you chose asphalt pavement for your parking lot, one of the things you probably appreciated about it was its deep, rich color. Over time, the sun’s rays will fade the color of asphalt pavement, leaving it less attractive. Most of the time, you just need to have sealcoating applied to restore the pavement’s color. Since sealcoating is also your pavement’s first line of defense against water penetration and automotive fluids, periodic applications can help extend your pavement’s life as well as make it more attractive. Contractors refer to this cracking pattern as alligatored asphalt. It is typically caused by water that has penetrated to the pavement’s foundation and destabilized it, but it can also be the result of subjecting the parking lot to heavier loads than the pavement was engineered to support. This is one of the most serious damages that your parking lot could suffer. The cracking pattern will expand, and you can expect potholes to form in the near future if they have not already done so. Repair normally requires the complete removal of the damaged pavement and the repair of the foundation before new pavement is installed. Your best defense against alligatored asphalt is to make sure that small cracks are repaired promptly to prevent water infiltration. You should also ensure that your pavement was designed for the loads it must support and enforce any required limits. For example, if you have a parking lot that was designed only for passenger vehicles, do not allow fully loaded tractor-trailers to drive or park on your lot. If you notice soft or crumbly areas, your asphalt pavement has likely been damaged by leaking automotive fluids. Asphalt is a complex mixture of asphalt, sand and stone. The asphalt acts as a binder to hold everything together. Asphalt is distilled from petroleum, and so are most of the fluids contained in modern vehicles. Gas, oil, asphalt, transmission fluid and other petroleum-bases products will try to re-combine when they come into contact with each other. As the asphalt reacts to automotive fluids, it breaks down and loses its ability to hold the pavement together. Although many people assume that sealcoating forms an impenetrable barrier against automotive fluids, these fluids will actually dissolve the sealcoating in time, leaving the pavement vulnerable. Therefore, it is necessary to clean these chemical spills in a timely manner even if you have recently had your parking lot sealed. At Asphalt Pavement Solutions, we are committed to helping our customers maximize the life of their pavements. Since 1983, we have offered an extensive range of maintenance services to customers throughout New Jersey, Delaware and Pennsylvania. Whether you need black top, sealcoating, crack repairs or pavement markings, we can provide you with extraordinary results at ordinary rates. You can request a free quote by submitting our online form or by calling (800) 559-SEAL or (856) 461-1710.